According to WPSD TV meteorologists, there was an unconfirmed tornado sighting in Dycusburg today right before 7 p.m. Funnel clouds were spotted just across the river in Livingston County. Residents of Dycusburg said the winds were howling and quite strong and loud. News reporters even urged parents to put helmets on the heads of their children if they had them. Fortunately, the storm passed quickly, and the area got some much needed rain. This serves as a poignant reminder that Kentucky is very much a tornado-prone area. 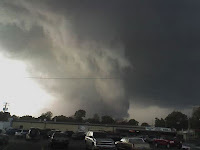 The photo above is from Marion, KY, taken by Scott Sullens. See www.wpsdtv.com for more photos. Your Petitioners residents of the Town of Dycusburg and being citizens thereof Knowing the deleterious effects and the evils resulting from the use and sale of Arden Spirits as a beverage within our corporation, Would most Respectfully ask and pray your Honor not to grant license for the Sale of the same within the corporate limits of our town to any Merchant, druggist or tavern keeper from and after your December term 1854 for the term of twelve months. AN ACT for the benefit of the Trustees of the Town of Dycusbnrg. § 1. That hereafter the trustees of the town of Dycusburg, a majority of the board concurring, shall have the power to grant a coffee-house license to any applicant therefore, who may reside within the corporate limits of said town, under the same rules and regulations, and subject to the same pains and penalties, which are now by law prescribed in such cases. § 2. It shall never hereafter be necessary to submit such application to a vote of the qualified voters of said town, before the granting of such license. § 3. The board of trustees shall have the right to charge, for such license, a tax of not less than twenty nor more than fifty dollars, in addition to that charged by the Commonwealth of Kentucky. § 4. All acts or parts of acts coming in conflict with this act are hereby repealed; and this act shall take effect from its passage. AN ACT to Increase the Jurisdiction of the Police Judge and Town Marshal of Dycusburg, in Crittenden County. § 1. That the police judge of the town of Dycusburg, in Crittenden county, shall have original concurrent jurisdiction in civil cases within the corporate limits of said town, of all sums evidenced by written contract or on account, where the amount in controversy, exclusive of interest and costs, does not exceed one hundred dollars, subject to appeals to the circuit and quarterly courts of said county, as in other cases now provided by law. § 2. The plaintiff in each action, where the sum in controversy exceeds fifty dollars, shall pay the same tax on, each original summons as now required by law on petitions in the circuit and quarterly courts; and the police judge of said town shall collect the same, and pay it over in the same manner, and under the same rules and restrictions, as now required by law of circuit court clerks. § 3. The town marshal shall execute all processes issued by the police judge of said town, and be entitled to the same fees as constables for similar services, where the amount in controversy, exclusive of interest and costs, is fifty dollars or less; and he shall be entitled to the same fees as sheriffs where the amount is over fifty dollars; and shall be liable upon his bond for any failure upon his part to faithfully discharge his duties, in the same manner that constables are. § 4. This act shall take effect from its passage. Crittenden County Board of Health: T. A. Frazer, M. D., Marion, Jno. W. Blue, Esq., Marion, T. L. Phillips, M. D. Dycusburg, W. T. Daugh, M. D., Marion, E E. Newcomb M. D., Repton. MARION, KY., August 8, 1903. Gentlemen—Supplementing our report of July 16, 1901, for the preceding four years during the two years last past, we have had two outbreaks of smallpox in the following districts or precincts: November, 1901, Marion and vicinity; March, 1903, Repton, Mattoon and Rodney, with the total of 102 cases and no deaths. We have no eruptive hospital. Our method of management was as follows: In all cases we quarantined the parties infected, and the parties exposed, in their own homes. The disease was brought to this county in several outbreaks from Evansville, Ind. In 1903 it was brought from southeast Missouri. It was recognized after twenty-five persons had been exposed altogether. In July, 1901, 2,000 persons or 12.5 percent, of our population were protected by vaccination; since that time I estimate that 4,000 persons have been vaccinated, making a total of 6,000 persons now protected by vaccination, out of a total population of 16,000, leaving 10,000, or 37.5 per cent, now unvaccinated. The total cost of managing the smallpox in the county, including hospital, physicians, vaccination, guards, nurses, food, etc., for all the cases which have occurred since my report in 1901, has been $850. The estimated cost to the county in loss of trade and interference with business has been $5,000. The chief difficulties in stamping out the disease have been to convince the people that it was smallpox, and to enforce vaccination. The health officer in this county does not receive an annual salary. The subject has been brought before the fiscal court and they now have the matter under consideration. The following number of cases of epidemic diseases have occurred in the county in the past two years other than smallpox: Twenty-five cases of diphtheria, with about six deaths; nine cases of scarlet fever in July, 1903, no deaths. I estimate that 140 cases of typhoid fever have occurred in the county within the last two years with thirty-one deaths. The chief cause has been polluted drinking water and improper sanitation. The average cost of typhoid fever per case in this county is about $150. I supplement the following additional facts which will be of general interest in this report. The chief difficulty of health officers is the lack of funds and the ignorance of the people regarding sanitation; and the thing most needed is to get the fiscal court to realize that money expended to improve sanitary conditions is a good investment. Do you have fond memories of the town or someone in the town? Please be sure to share your stories by e-mailing me at matthewtpatton@yahoo.com. I have to admit I was really offended by the anonymous post asking why I was so interested in Dycusburg since leaving there. That was a pretty direct and mean (and unnecessary) attack, considering all of the interest I have helped raise in the town. With the Internet, phone and e-mail, you can obviously do things even when you live across the country to help benefit a town. Although this may come across narcissistic to some, hear me out. In no time in Dycusburg's history were people so excited about its story until the book was published on the town in 1999. I have helped with grant money, have donated money to causes in the town like cemetery upkeep, and even had a monument placed at Marion in honor of Dycusburg's son, Forrest Carlisle Pogue, Jr. I have spent untold hours scanning old photos for people to enjoy. I have written countless articles printed in various media about Dycusburg in hopes of helping rid its ill-repute, including a recent story in Kentucky Monthly magazine. I have maintained this Web site for more than 5 years and have never asked anyone for a single cent for its upkeep (and no, these things aren't free nor cheap!). Obviously, even my No. 1 critic (who posted anonymously) took the time to come here and see what was happening in Dycusburg. So, yes, now I'm 1,000 miles away from home, and I travel all over the country for work: Los Angeles, Dallas, Houston, Chicago, San Diego, San Francisco, Seattle, New Hampshire, Maine, San Antonio, Washington, DC ... I think you get the picture. Through work and other personal travel, I've seen nearly every state, and having seen the country from shore to shore, I have learned to appreciate where my ancestors settled, and see its appeal. This is the land where my great-great-great grandfather raised his family, and several generations followed. If you've ever gone to college and realized that career opportunities aren't too glamorous in a place like Dycusburg, then surely you'd understand. If you haven't, then don't be so quick to judge or assume. In the post, the person said I hated the town. I'm sorry, but I definitely don't recall "hating" Dycusburg. Perhaps its better to surmise that I hated the opportunities that weren't (and still wouldn't be) afforded to many folks there. If I had job opportunities there, I would gladly move back. Years ago, Lit and Pauline Ferguson had a restaurant in Dycusburg -- “Lit's Place” is all I ever knew it by. Their daughter, Pat and her husband, Parker Holsapple never ran the business for a living, but would come home on vacation and give Lit and Pauline a break. Years went by, people passed away, things moved on, and changes come as they do. The restaurant was closed, and then sold. The building was made into a grocery store. More years went by and the store went up for sale again and again. The new owners, Rick and Debbie Holsapple, grandson of Lit Ferguson, had a dream. They wanted to add a restaurant ... and they have! The Riverside Café is the most hopping little place in town. A couple weeks ago, Rick and Debbie’s daughter, Star along with her husband, Josh and son Jacob, moved into the restaurant business. Star is excited about being in the same place her great grandparents worked, she has big plans for the little café. Even little Jacob has his future planned for him; mom, Star says some day he will be the fifth generation to own and run the restaurant. The Riverside Café holds a fish fry on Fridays. The fish starts cooking at 11 a.m., and the live music begins around 7 p.m. For just a small price, you receive deep fried filets, coleslaw and hush puppies. The menu also includes burgers and BBQ. Riverside Café's hours have been extended from 6 a.m. to 8 p.m., Tuesday-Saturday. The owner of Riverside Café, Star Mahns, reports that the change will accommodate the breakfast crowd. If you want to get a good, hearty breakfast and coffee, be sure to stop by the café! Also, she wants to remind everyone every Friday is open mic night down at the store. Anyone who is musically inclined is welcomed and encouraged to join the fun. Without a doubt, there's some real talent showcased on Fridays, from gospel to country to rock 'n roll. You might even see a youngster or two belting out some tunes down at the store on the Cumberland's banks. Finally, look for more information on this site about Bingo night at Riverside Café. Proceeds from the game will benefit Dycusburg community initiatives, such as Fouth of July fireworks, and other upcoming community projects. It's nice to see everyone taking an interest in the town of Dycusburg! Some folks recently asked me why I keep up this Web site (one through a nasty, poorly written anonymous post on this site) despite the fact that I don't live in Dycusburg. It’s a simple answer, really. The simple answer is job opportunities. As we all know, there's hardly any job opportunities in Dycusburg. After graduating from college, I made a decision to leave. It's not that I couldn't wait to get out of Dycusburg, it's just that I really didn't have a lot of choices, particularly career choices. It's true that I took a lot of interest in the community after I left. As you get older and learn more about life, you realize Dycusburg is rich in history and rich with many kindhearted, good folks. Dycusburg is a community worth celebrating, and that’s why I keep up this Web site. Thanks to everyone who reads about the community. Sitting in a room with his father at Walter Reed Army Medical Center, Chase Matthews knows he’ll be missing out on some fun Saturday night. But, he takes it all in stride, choosing to focus on his duck-hunting trip next month. While Matthews continues to recover from another surgery to further repair his left arm and left leg crippled in Iraq, another of his fellow soldiers will be home to enjoy a benefit concert planned for this Saturday. “I wish I could be there, but I’ve got to stay,” Matthews said from Washington, D.C., as his father, Rudy, stood by. Benefit Bravo, set for 7:30 p.m., at Fohs Hall, will bring together four classic rock and country music acts to raise money for Spec. Matthews and Sgt. Jonathan McMackin. The two local men were injured by a roadside bomb this spring while on patrol in Iraq with their Kentucky Army National Guard unit, Bravo Company based in Marion. Matthews eventually lost both legs and damaged his left arm. McMackin suffered a broken leg, and still walks with a bit of a limp. Jent, of Eddyville, is manager of Bobby Clark and Witch Doctor’s Hooch, one of the bands performing Saturday. He said the idea for the benefit came when he saw a plastic jug in an area store seeking donations for one of the soldier’s recovery. All of the proceeds from the $5 admission to the music show and anything left over from corporate sponsorships will go to Matthews and McMackin. “Whatever it is, it goes to the boys and the cause,” Jent said. Appearing on stage will be Jent’s band, made mostly of members from the region; recording artist Marshall Sanford; Richie Lindsey and Friends, a Crittenden County band; and Warren Batts, former guitarist for Bill Haley and The Comets. Batts, in fact, will be emcee for the night. Jent said his band’s connection to John Mellencamp allowed him to land two autographed posters of the rock legend from Indiana. “One of our band members is first cousins with John,” Jent said. The posters, as well as some gift baskets for the ladies, will be raffled off Saturday. Aside from the money raised through such efforts, a gift pack to each of the soldiers will include autographed CDs from Mellencamp and Charlie Daniels. A camera crew will also be on hand Saturday to record the event on DVD for Matthews and McMackin. Meantime, Matthews will continue his physical and occupational therapy at Walter Reed, adjusting to losing both legs and working toward full-range of movement in his left arm. His most recent surgery scraped away some more bone from the left leg in order to allow his prosthesis to fit more snugly. When the stitches come out next week, his dad said, he’ll begin getting used to the new fit. “It won’t be long before he’s up and going again,” Rudy said Tuesday. Rudy will stay in Washington with his son until his next leave from the Army hospital, hopefully for Thanksgiving and Christmas, Chase said. “I’m coming along pretty well,” he added. He doesn’t plan on missing his hunting trip Nov. 9-11. He and three other soldiers, as well as Rudy, will be treated to a weekend at Pintail Point, a river plantation on Maryland’s eastern shore. Bass Pro Shops is paying for the trip and new shotguns as gifts the soldiers will use to hunt the ducks. Connie Brasher-Gould supplied this anecdote about Rev. E.S. Denton, pastor of Dycusburg Methodist Church (1933-1934). Rev. Earnest S. Denton, a newly ordained minister in the Methodist Church was on his way to preach his first sermon in his first appointed pastorate, Dycusburg Methodist Church. At that time, Hwy. 70 was not paved and there had been quite a bit of rain. Bro. Denton's car got stuck in the muddy road near the James Riley Brasher farm (three miles out Hwy. 70 from Dycusburg). The young Reverend did not want to miss his first chance to meet and preach to his first congregation, so he left his car in the mud and walked to the Brasher home. He relayed his plight to the Brashers and my father Gray Brasher, loaned the preacher his mare, Pearl, to ride on into town. After Rev. Denton headed toward town, Daddy took the mules, pulled the car out of the mud and drove it on down to the church. As he got into the car, he noticed the preacher’s briefcase on the seat. So, when he arrived at the church, even though it was in the middle of the new preacher's service, he walked into the church in his muddy boots carrying the briefcase. When he got to the front, he said, "Preacher, I brought your satchel in. I thought you might have your sermon in it." Years later, when Bro. Denton was pastor at Ogden Memorial Methodist Church in Princeton, he told this story to the congregation when I joined the church there. He also added, "I would never have admitted it then (his sermon being in his briefcase), but it was." After him being ordained, I was the first baby Bro. Denton christened, but there were hundreds that came after me in his many years of Christian Service. Connie Brasher-Gould shares these memories of the Dycusburg Methodist Church. This information appears in The Churches of Crittenden County (pp. 62-64) by Matthew T. Patton and Bonnie R. Gass (2003). My earliest recollections of the Dycusburg Methodist Church are of when, as a small child, I went to Sunday School there. My grandmother, Eula Vosier, taught the children’s class in the back left corner of the sanctuary. In those days, though, it was not called the “sanctuary,” as it was just the “church,” in one big room. Back then, Dycusburg Methodist Church was on a four-church circuit, so the preacher was there to hold a full worship service on one Sunday a month. That weekend, he would arrive on Saturday, have “preaching” that evening, stay overnight (usually at Eula and Lucian Vosier’s home), and then have “church” on Sunday morning. (Some of the reasons the preacher stayed with the Vosiers may have included: the home being fairly close to the church with a spare bedroom, and, the fact that Mrs. Vosier was a very good cook couldn’t have hurt.) Services were well attended, music was good, and the “amen” corner and a couple of men who always slept through much of the service made it interesting even for the children. On the Sundays the preacher was “filling the pulpit” at one of his other churches, the bell still rang and the members came together for Sunday School. They would sing two or three hymns, with Mrs. Mollie Lee Graves at the piano and Lucian Vosier leading the singing. Anyone who wanted to went up and sang in the choir (a custom continued to this day), have announcements and prayer, and then divide into smaller groups in the four corners of the church for the prescribed Bible lessons. After the lesson and taking up the offering, they would again assemble, sing more hymns, hear reports on attendance and offerings for the day, and be dismissed with another prayer. Once a year, if I remember correctly, the District Superintendent came with the current preacher, and held what was called, “Quarterly Conference.” This was an annual meeting when all business was conducted in the church during the past year was reviewed and plans for the next year were made. Quarterly Conference was an all-day affair, sometimes referred to as “preaching all day and dinner on the grounds,” or vice-versa. Families brought baskets with wonderful home-cooked food—fried chicken, country ham, all kinds of home-grown vegetables and cakes with truly ‘heavenly’ tastes—that was spread on makeshift tables set up at the edge of the parking lot. After the meal, the adults would go back into the building for the business meeting and the children would keep themselves occupied outside with various games and inspecting the “initial trees” in the woods beside the parking lot. Another familiar memory of customs in the old church was the Christmas tree. Every year at Christmas, a huge cedar tree was placed in the front right corner of the church and decorated for the season. On Christmas Eve, there was always a special program. Some people brought surprise gifts for their family and friends. The church provided individual bags with fruit and candy in them for all who attended the program. Some of the adults received a shiny new silver dollar. My Uncle Bud (Frank Anthony Vosier), although very Christian in his practice of everyday life, was not a regular church attendee. However, he was always there for the Christmas service, as were several others infrequently seen at regular services. The Ladies Aid Society (now United Methodist Women) was a strong support group within the church. Almost all of the ladies in the church belonged to this group that met in homes and spent many hours studying the Bible and piecing and sewing quilts. In 1945, the church members decided they needed more space and a furnace to replace the old stove to heat the building. It was decided that a basement would be dug under the existing building. This would give them space for Sunday School rooms, a furnace room and a coal bin. Later, a kitchen was added in one of the rooms. The digging started, but soon it was evident this wasn’t as practical and easy as it seemed in discussion. Supports under the building had to be moved and then the old building began to feel unstable. It was apparent the old building had to come down before it fell into the hole that had been dug under it. When the basement was finished, a new building would be constructed over it. F.A. “Bud” Vosier was contracted to build the new church. Mr. Bud was considered an expert carpenter and builder in Dycusburg, having built many homes and business structures. Also, he was the principal carpenter in the building of the “Wolverine,” the first diesel-powered packet boat, built in 1932, making regular trips from Dycusburg to Paducah. As Mr. Bud and his helpers labored on the church project, his niece, Elaine Brasher, took him to see the Methodist church in Princeton, KY. He borrowed some ideas from this and other churches in his design of the interior of the building such as an entry area partitioned off from the main room. This not only allowed late-comers a place to wait until an appropriate time to enter the service, but it also afforded a buffer between the cold outside air and the heated sanctuary. He also elevated the choir loft behind the pulpit, and put a small room on either side of it for classrooms. Perhaps his proudest accomplishment, but most labor-intensive detail within the building, was the curved altar rail. The top of the rail was a 1 x 4 or 5 inch plank to start. The curving was accomplished through a series of soaking the wood with water, then forcing it into a hand-built frame with movable pegs. After the soaking, Mr. Bud would place it in the frame to dry. Then, take it out, soak it again, replacing it in the frame, again and again. Each time he went through this process, he moved all but the center pegs a little to make the wood conform to the curve he envisioned for the finished altar. When the new church building was completed, pews from the old church were reinstalled. It is generally reputed that Mr. Bud Vosier built these pews many years before, and they are still in use today. A dedication service was held in the new building on June 27, 1948. Coming Soon to Dycusburg: New Flagpole! The Dycusburg Community Fund Foundation has achieved its first milestone. A new flag has been donated, and the group is working on securing a flagpole. It's a tribute to all of those who fight for the country and in memory of those from our area who served our country in the past. Look for more details on this site soon. The Tri-State Genealogical Society will hold its annual fall seminar on Saturday, Oct. 20, 2007 at the Holiday Inn Conference Center, Hwy 41 North at Lynch Road, Evansville, IN. For more information, visit Brenda Joyce Jerome's Western Kentucky Genealogy blog here. Brenda Joyce Jerome, CG, author of several Kentucky genealogy books, has launched a blog on Western Kentucky Genealogy. Check it out at http://wkygenealogy.blogspot.com. With all of the information Brenda has at her fingertips, I am certain the blog will be quite interesting and informative. It seems that as Christmas approaches, I tend to get more e-mails about Dycuburg books. At this point, I have none in my inventory. I would be willing to order some more if enough folks are interested. Please e-mail me at matthewtpatton@yahoo.com if you would like to add your name to the running list for the next printing. We received this e-mail from David Sullivan of Denver, CO, detailing his great-great grandmother, Rachel Catherine Tolley. She is pictured at right. If you have any information on these families, David would appreciate hearing from you. He can be e-mailed at DSulliII@aol.com. Born 15 Jul 1839, my GG-Grandmother, Rachel Catherine Tolley, had a son by Robert Tinsley in 1855 named John Alexander Tinsley. We don't know if they were married or not. On 6 Nov 1859, she married Dycusburg's Nehemiah Grassham (shortly after burying the mother of his children, Mary Polly Clark, who died 20 Aug 1858). At that time, Rachel's last name was "Wells", so she must have been married to somebody by that last name. We've not found who he was or any marriage or divorce paperwork regarding them other than the marriage paperwork to Nehemiah. On 26 Jun 1870, she married my GG-Grandfather, Isaac Sullivan. Sometime between that date and the 1880 census, Isaac and Rachel moved to Rosiclare in Hardin County Illinois. But until that time, Rachel seemed to be a Dycusburg resident. We're not sure where she was born although we know it was SOMEWHERE near Dycusburg. She had an older brother, John L. Tolley, who was born in 1817 in Eddyville. She had a younger sister, Nancy Ann Tolley, who was born in Crittenden County on "Old Dycusburg Road." We presume that their parents, at that time, lived between Fredonia and Dycusburg. 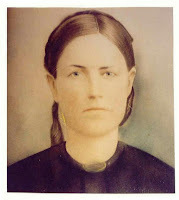 She had an older sister, Tabitha Ann Tolley, who married William M. Hill on 23 Dec 1844 in Crittenden County in their parents' house "on old Dycusburg Road." William M. Hill, in addition to being noted as a fair groceryman, also became a Judge in that area. William and Tabitha Hill had a son named Charles H. Hill who became very instrumental in the Baptist Church in Dycusburg. So that's pretty much some connecting background to my GG-Grandmother, Rachel Catherine Tolley. If anybody can help us learn about her immediate family (presuming that many of the details I've provided here are hopefully correct), we'd TRULY appreciate it! Based on her appearance in this photo, she should have been approximately 20 years old. That would be about the time that she married Nehemiah Grassham. So the date on the photo should be circa 1859ish. We presume that it was a painting. The most likely candidate in that area at that time for her "Mr. Wells" appears to be James W. Wells, step-son of George Washington Markham (of Dycusburg). It appears as though Mr. Wells may have gone to Louisville to study art. Maybe it's possible that HE is the one who painted the picture. We don't know, but it's a possibility. James W. Wells and his Markham step-siblings moved on to San Joaquin County, California shortly after that and got written into their history books. Turns out that Wells became a Minister and Professor. Well, Dycusburg has been crucial to the research of our family. We sprang up from there. Having no known family there any longer, and now living in Denver, Colorado, I want to tell you that I am utterly thrilled that you have taken the time to make your site available to us. Thank you SO much. And I hope you can take advantage of this photo and that maybe it will help us to learn about our Tolley/Crider family in Crittenden County. Thank you to whoever hauled off the old recliner that was sitting out. That was very nice of you. I am so happy to see everyone taking pride in our town. Homecoming was held at the Baptist church on Sunday. A big crowd attended services. Bro. Jerry Thurman, a former pastor at the church, preached and following services was a huge potluck dinner. The Hampton Brothers sang in the afternoon. Everyone enjoyed the day. Fall Revival at the Baptist church will be held Oct. 14-17. Sunday services will be at 9 a.m. (Sunday School), 10 a.m. and 6 p.m., for worship services. Monday-Wednesday services will be held at 7 p.m. Everyone is invited. Matthew T. Patton informs us that he updates dycusburg.com every day or two with interesting local anecdotes and news. The site has also recently been redesigned. Be sure to check it out! Do you have some great recipes to share? The Dycusburg Community Fund (DCF) Committee will be printing a cookbook to benefit the DCF. The proceeds from the book will benefit future Dycusburg Day events, special holiday celebrations or other special community projects. The group is accepting recipes via e-mail at tcochrum1@localnet.com. Deadline for recipes is Nov. 15, 2007, and printing will occur in early 2008. If you'd prefer to mail your recipes, please send them to PO Box 59, Dycusburg, KY 42037. Although we welcome all recipes, we are looking for recipes from with a solid family or heartwarming story behind them, such as a recipe handed down through generations or a classic dish made with a twist. Include the story or history behind the recipe if you can! The Dycusburg Community Fund Committee will hold a meeting at 6 p.m. Tuesday at the Dycusburg Baptist Church Fellowship Hall. Anyone interested in our goals, fund-raisers, projects, etc., please attend. The Dycusburg Post Office has all the latest mailing supplies and stamps. They offer money orders and fax services. Boxes are available for rent and the lighted lobby is open 24 hours a day for your convenience.